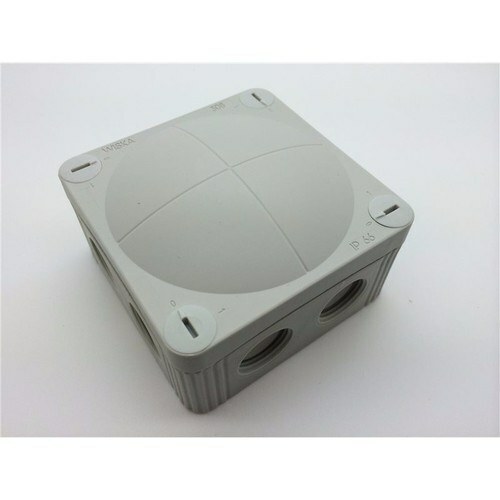 The Wiska 308/5 Junction Box in grey is ideal for both indoor and outdoor electrical connections. IP66 Rated Connection Box, protected against dust and powerful water jetting. Good to look at The Designer Box. The WISKA COMBI with its unmistakeable bellied lid provides the utmost in visual and functional perfection. Now you can install with system AND with style. Known to save up to 30% on labour costs. External box dimensions of 85mm x 85mm x 51mm. Solid Grey Impact Resistant Thermoplastic 2 Mold Housing. Fast Cable Entry via Soft Sealing Membrane. M20 Threaded knock outs. No locknuts necessary. 8 Gland entries capable of taking 2 flexible conduit glands on each side. Captive and Rust-Free, Quick-Release Lid with Plastic Screws closing the box with a Quarter Turn. Weather proof, resistant to ultraviolet, shatter proof and impact resistant . Mounting clip for snap-on fixing or via 2 internal openings outside of the sealing area. Comes complete with a 5 way loose connector and External Fixing Bracket. Comes complete with a 1 year warranty from the manufacture, Wiska.